Potassium is an essential mineral that is needed for the normal functioning of the body. It is the most plentiful mineral in the cells and is also very important in the circulating blood throughout the body. Potassium is supplied by our diet, largely from fruits and vegetables, but often supplements are required to provide adequate amounts. Normal levels of potassium must be maintained within and around cells and in the circulation of blood. The body's ability to retain potassium is dependent on an adequate amount of magnesium within the system; for this reason, someone in need of a potassium supplement should consider pairing it with a magnesium supplement, such as Alta's Magnesium Chloride. Excessive sweating, caused by exposure to heat or by heavy exercise can increase the loss of potassium. Substantial amounts of potassium and chloride are also lost with severe diarrhea, excessive urination, and with the consumption of large amounts of sugar-sweetened drinks. Patients receiving diuretic therapy and develop muscular weakness or loss of appetite should consult their physician for advice as to whether they require a potassium supplement. Excessive loss of potassium can cause an acid-base disturbance that is termed "hypokalemic alkalosis." This condition is intensified when chloride is also lost, as is usual with heavy perspiration or conditions that cause increased loss in the urine. 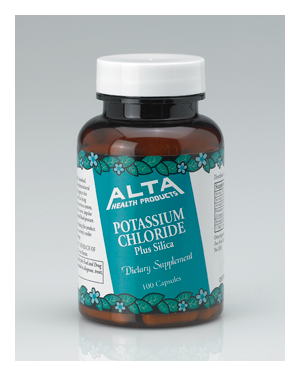 By adding Alta Health Products' Potassium Chloride, this disturbance is greatly decreased. When hypokalemia develops, especially when chloride deficiency also exists, supplemental amounts of potassium chloride are commonly needed. Abnormal amounts of potassium in the blood (too little or too much) can give rise to abnormalities of the heart's rhythm (called "arrhythmia"), which can be life-threatening. Your physician should be consulted as to the amount of potassium chloride you require. As a dietary supplement take 1 capsule daily. Manufactured with natural fillers, binders, coatings and excipients including: Whey, Gelatin, Calcium Silicate, Magnesium Stearate. Free From: Sugar, salt, yeast, wheat, soy, colorings, flavorings, or preservatives. No GMO. Gluten Free.